Ensure ADA (American with Disabilities Act) and Rehabilitation Act compliance with this indispensable guide. 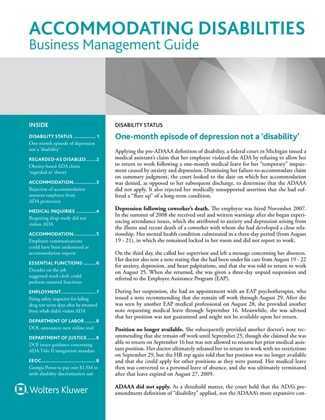 You'll find the entire scope of disability and accommodation requirements thoroughly covered with practical, cost-effective strategies. Topics covered include compliance planning, employment rights, accommodation assistance, access to public facilities, transportation services, telecommunications, and administration/Enforcement. This service puts at your fingertips all of the information you need to understand the complicated federal requirements for providing access for people with disabilities to employment opportunities, public accommodations, commercial facilities and transportation services. The full text of federal statutes and guidelines are provided along with hands-on explanations of what they really mean.